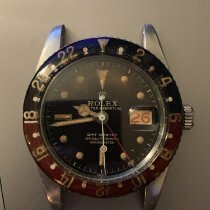 We are happy to found this Rolex GMT with ref. #6542 at a passionate watch collector. He owned it for many years and we were allowed to purchase this rarity from him. There is so much to tell about this icon model from Rolex. One of the most important features is the missing of crown protection. The original crown itself still has the brevet cross, which often occurs in models where there is an indent line between the word GMT and Master. The original gilt dial is original and is still lightly provided with radium index lume. The swiss OCC dial is beautifully aged. 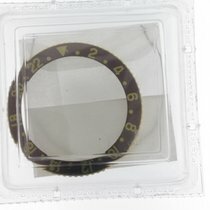 In the year 1959, the bakelite bezel was slowly replaced by an aluminum insert. We bought this GMT with a completely damaged aluminum insert, but we provided it with a very good aftermarket bakelite inlay. The old aluminum inlay is, of course, supplied, even though we can not guarantee that this is a time correct model. But we like to keep it together and leave the decision to the new owner what to do with it. The riveted Oyster bracelet with the end link 58 produced in the 2nd quarter of 1962. The watch with movement caliber #1066 has been checked and serviced and works properly. We have to take into account that it is a 60-year-old movement with that accompanying specifications. If you have any questions please let us know, We are happy to serve you and we love to welcome you to our store in Amsterdam.